Ireland needs to step up and do more if we are to achieve our climate targets, the Minister for Climate Action told the Seanad today. 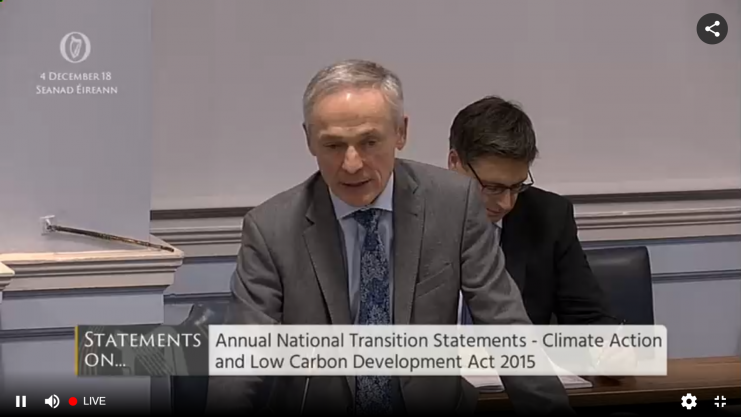 Announcing the 2018 Annual Transition Statement, Richard Bruton TD emphasised the importance of this year’s statement in drafting a plan to make Ireland “a leader in responding to climate change”. Earlier this month, Mr Bruton said that Ireland will fail to meet our 2020 target of reducing emissions by 20 per cent below 2005 levels. Today’s statement, however, is an opportunity to “commend” what Ireland has achieved recently, Mr Bruton said, and outline a future where Ireland plays a greater role in leading on climate action. The Government has also allocated €22 billion to climate-related investment in the new National Development Plan, Mr Bruton added, that will be spent between now and 2027. The new National Development Plan pledges to increase the number of electric cars on the Irish roads to at least 500,000 by 2030 as part of its emission-curtailing measures. Minister Bruton has also recently made regulations that would increase the rate of biofuels in the transport fuel mix from 8 per cent to 10, starting from January. According to this year’s statement, Ireland’s first green bond issued in October may allow the financing of climate-related expenditure at a lower rate of interest than other expenditure. The statement indicates that the building regulations are undergoing amendments to ensure that new houses will meet the Net Zero Energy Building (NZEB). The Government is also set to bolster the Public Spending Code to ensure that carbon impacts are fully reflected when funding any public project, as part of its new mitigation plan. Under the new carbon-curtailing policy, four Climate Action Regional Officer has also been established to support local authorities in meeting their climate regulations.